The standard image capture in API in the iPhone SDK is the UIImagePickerController. There is much discussion on the web about how this can be customized via subclassing, both from the viewpoint of technical feasibility, and from the viewpoint of being allowed onto the AppStore. It is generally accepted that going direct to private frameworks is unacceptable, even though this arguably can give a better user experience. Phanfare had their app pulled from their AppStore for using the PhotoLibrary private framework, and returned with a new version that instead customizes the UIImagePickerController experience. 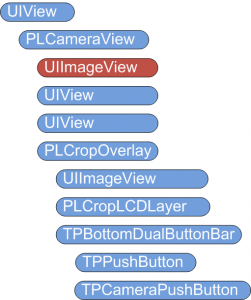 I took an in-depth look at the view structure that the standard UIImagePickerController creates. The first is obtained by looking at self.view and is not particularly interesting. It consists of a UITransitionController and a UINavigationController and is clearly the meta-system for switching between the capture and preview screens. Several of these classes are undocumented, but that doesn't prevent us from manipulating them with standard APIs. 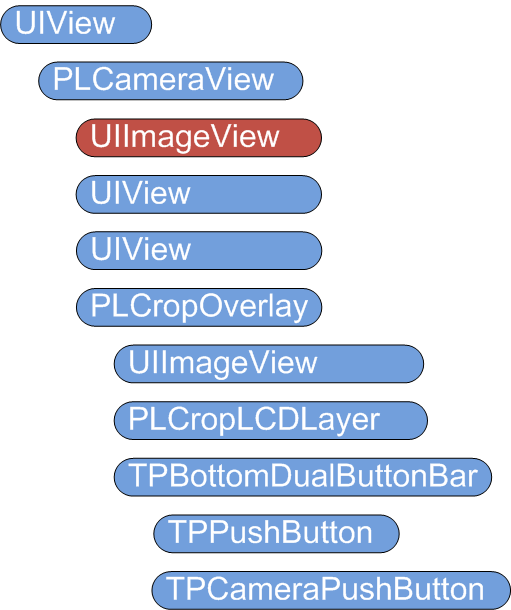 Experimentation showed that the UIImageView highlighted in red is the important one - it's the camera preview pane. You can remove every other view, and just retain this one, and you will get a full-screen camera view. You can also move the TPPushButton (which represents the cancel button) out of the hierarchy and place it elsewhere on the screen. Doing the same with the TPCameraPushButton causes a crash when you activate the button, because the PLCameraController tries to modify the buttons, and fails because the view structure has changed. You can also add further views (as Phanfare did) to overlay extra details. Clearly there is yet more scope for customizing other aspects of the hierarchy - this requires more experimentation, and we'll report on this as we learn more.